I haven't received fabric in the mail for at least 2 months, so this was an exciting weekend! I've been really careful about spending money lately, but when I won a gift certificate to Pink Chalk Fabrics (Thank you to Pink Chalk and the fabric gods!! ), I couldn't resist picking up some prints I've been admiring from afar. I bought several prints from Violet Craft's new line, Waterfront Park. Those birds KILL me - NEED the other prints (maybe around Christmas, if they are still around!) (crossing my fingers). The low-volume-ish boat/bridge print will work on several projects (and my LV stash is running very low after almost finishing the Modern Maples). 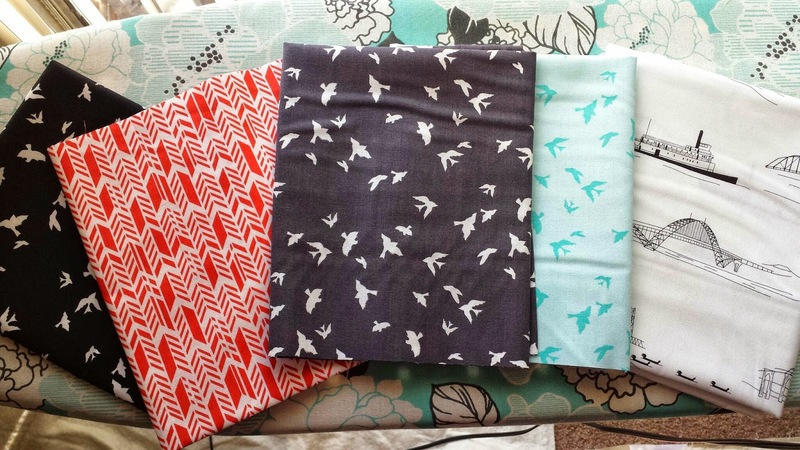 Plus, I've been drooling over Sunprint by Alison Glass, so I picked up a half yard of the red feathers. I'm planning to use it to bind the Modern Maples this week. There probably won't be much left afterwards (tears) - BUT, it will be one of my fastest turnarounds between buying fabric and using it. What fabric are you lusting after right now? Nice haul! I love those birds too...can't I just get one of everything? Gorgeous fabrics, I am trying very hard not to lust, although any text prints might be my undoing! The more I see waterfront park the more I want it! I am supposed to be working from my stash this year, le sigh. I have bought some things though. I'd also like more collage and Nordika. Very nice first purchases! I'm needing to go on a fabric fast for a while myself, and some of the last stuff I bought (online) was some of the Sun Print feathers. If I could, I'd buy a half yard of every fabric in the line, but sigh, my better sense (for once) has prevailed. The Violet Craft fabrics are wonderful too, aren't they? gorgeous additions :-) Love that low volume print especially. Hope you come back on November 17 to link when I host Sunday Stash! Oh man I love those birds too! But yeah I totally can't buy anything else...especially after the recent Sunnyside purchase!